These yellow 89? tri-level closed auto racks have white roofs, BNSF 1996 blue & green ?Circle/Cross? logo lettering, and runs on black Barber? roller bearing trucks. The flat cars are owned by the TTX Corporation; Burlington Northern Santa Fe Railway owns the racks. Tri-level racks continued to be used predominantly for automobiles, while the bi-level racks were primarily used for light trucks and vans. The first auto racks had exposed sides that led to vehicle damage from vandalism and weather. The railroads started to enclose them with steel mesh in the early 1970?s. Auto racks are one of the most commonly seen cars on the railroads today. This box car red 50? flat car with fishbelly sides and side mount brakewheel carries a ship engine load while running on black Bettendorf trucks. A group of 50 cars were assembled by Lehigh Valley from General Steel Casting Corp. cast steel bodies. By 1985 nearly all had been upgraded from 140000 lbs. to 154000 lbs. load capacity. In 1853 when its major source of revenue was coal hauling, Lehigh Valley was tagged ?the Route of the Black Diamond?. Produced at the dawn of the 20th Century, the disconnects were the backbone of a number of standard and narrow gauge railroads throughout the western United States. Our model represents an all-steel version equipped with Hercules Logging Bunks that swivel as the prototype does. The resin log load is secured with scale brass tie down chains. The model also features Magne-Matic? Couplers on both ends of each car as was prototypical. This 40? standard box car with plug door is car #46 of a 50-car series representing each of the 50 states in the union. It bears the Ruffed Grouse and Mountain Laurel, Pennsylvania?s official state bird and flower. The flag of the state of Pennsylvania is in the background. The road number 1787 represents the year the ?Keystone State? was admitted into the union. This 50? standard box car with single door is car #5 of a 13-car series representing each of the 13 provinces and territories of Canada. It bears the Great Horned Owl and Wild Rose, Alberta?s official provincial bird and flower. The flag of the province of Alberta is in the background. The road number 1905 represents the year the ?Strong and Free? province entered the confederation. Charged with the responsibility of keeping all the track, truck, baggage and freight scales on their respective lines in perfect condition, the scale inspector?s arrival was often preceded by the appearance of the small scale test car. The scale test cars were always to be hauled just in front of the caboose. Immediately upon arrival at the terminal, they were set aside and subjected to a minimum of switching. Under no circumstances were they to be used in switching other cars in the train. This reefer yellow 50? standard box car with plug door and no roofwalk has black ends and aluminum roof with black and white ?CNW? logo. It runs on black roller bearing trucks. The well-known ball-and-bar emblem of the C&NW first appeared in 1885. In 1970 the Chicago & North Western Transportation Company was incorporated as the North Western Employees Transportation Co., owned by nearly 1,000 C&NW employees; the road?s herald carried the words ?Employee Owned? from 1973-1982. This 50? steel side 15 panel gondola with fixed ends carries a quarry load and runs on black Barber? roller bearing trucks. One of 50 PS-5s built in 1958 by Pullman-Standard for the Rock Island, 3091 was repainted at the Despatch Shops in East Rochester, NY in March of 1967. Rated at 70-tons, or 1746 cubic foot capacity, the car is constructed with a wood floor, indicated on the car side with the circle-W symbol. This yellow 60? flat car displays typical Trailer Train lettering and logo with black stenciling and runs on roller bearing trucks. TTX Company provides rail cars and related freight car management services to the North American rail industry. 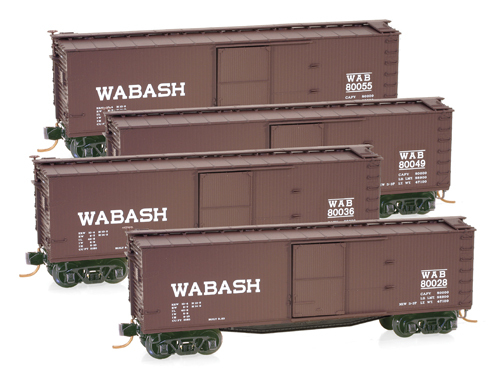 Pooled rail cars are for service in the intermodal, automotive, lumber, machinery, building materials, steel, and other commodity groups where flat cars, box cars, and gondolas are required. 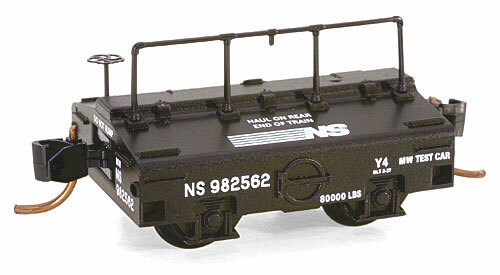 NEW Z SCALE BODY STYLE! This box car red 40? despatch stock car with single door has white lettering and runs on black Arch Bar trucks. Former CP subsidiary Quebec Central Railway #2266 in the mid-1910s, this car was repainted and reweighed at the Weston Shops, Winnipeg, in August 1962, for the Canadian Pacific. As with most CP stock cars, this one did not receive a coating of white paint on the sides that helps camouflage the lime disinfectant. This box car red, 50? box car with double Youngstown doors displays the large white ?Route of the Silver Meteor? paint scheme, a 56? SAL ?Through The Heart Of The South? Herald, and runs on black Bettendorf trucks. Built in 1938 by Pullman-Standard, these cars had a double door opening of 12? 6?, an inside height of 10?1? and a capacity of 50 tons. These PS-2 70 ton two-bay covered hoppers are painted Chessie Signal Yellow and display the large ?Ches-C? herald in blue. They run on black roller bearing trucks. Built by Pullman Standard in 1968, the series 604100-604199 had 2700 cu. 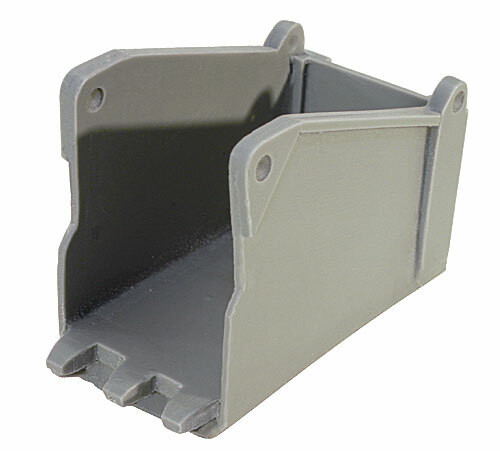 ft. capacities and were delivered in gray with the black B&O Capitol Dome herald. Cars of the HC-25 class were serviced in 1985 and re-painted in the Chessie System yellow/blue scheme on an ?as shopped? basis; there were variations in how the scheme was applied. Here the ?Ches-C? herald is stenciled in the center of the wide center panel. This scheme also includes the use of the ?Keep Safety Rolling? slogan. This dummy F-7 B unit locomotive is painted black with wide gray side stripes and narrow white stripes. The roof, grills and tanks are black. The EMD F7 was a 1,500 hp B-B freight-hauling diesel locomotive produced between February 1949 and December 1953 by General Motors? Electro-Motive Division. Final assembly was at GM-EMD?s La Grange, Illinois plant. A total of 2,366 cab-equipped lead A units and 1,483 cabless booster B units were built. This dummy F-7 B unit locomotive is painted black with orange stripes and the black ?The Milwaukee Road? lettering. The roof, grills and tanks are also painted black. The EMD F7 was a 1,500 hp B-B freight-hauling diesel locomotive produced between February, 1949 and December, 1953 by General Motors? Electro-Motive Division. Final assembly was at GM-EMD?s La Grange, Illinois plant. A total of 2,366 cab-equipped lead A units and 1,483 cabless booster B units were built. NEW! Denver & Rio Grande Western? This dummy F-7 B unit locomotive is painted yellow with wide aluminum side stripes and narrow black side stripes. The roof and tanks are black while the grills are aluminum. The D&RGW? served mainly as transcontinental bridge line between Denver, Colorado, and Salt Lake City, Utah, and a major origin of coal and mineral traffic with a motto of ?Through the Rockies,? not around them. The Rio Grande was the epitome of mountain railroading, operating the highest mainline rail line in the United States over 10,240 ft Tennessee Pass in Colorado and the famed routes through the Moffat Tunnel and the Royal Gorge. This body style is typical of log cars utilized on narrow gauge railroads across the United States early in the 20th century. This model comes undecorated so the modeler can adapt the car to existing layouts. Included is a custom resin log load complete with scale chain wrappers. We?ve left the log load unattached so the load to be displayed on or off the car. This provides the option of running with or without the load in place. This car comes with our new Arch Bar trucks that allows the side frames to pivot with the irregularities in the track for smooth, reliable operation. Our commemorative, collectible seven freight car train set honors the memorial of Battleship Row in Pearl Harbor. 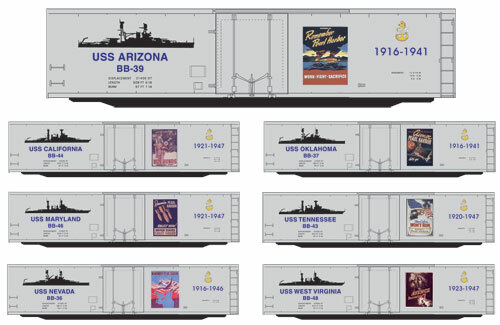 Each freight car is decorated with a reproduction of an actual poster created during WW II to encourage patriotism and the name of one of the seven ships moored at Ford Island during the attack: USS Arizona, USS California, USS Maryland, USS Nevada, USS Oklahoma, USS Tennessee, and USS West Virginia. This set will be offered in a commemorative tin box. Accepting Pre-Orders thru Feb. 28th! Capture the spirit of this traditional Christmas carol in your holiday d?cor with Micro-Trains? ?The Twelve Days of Christmas? series. To complete your set, Micro-Trains? is releasing matching locomotive B Units.